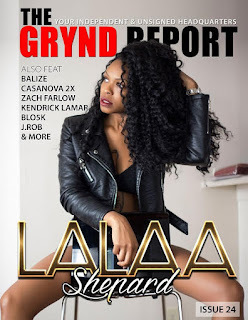 Out Now The Grynd Report Issue 24 Lalaa Shepard Edition @lalaashep Publicist Lalaa Shepard has taken a leap of faith to follow her dreams within the music business. Making that decision has consistently paid off. Now gracing the cover of The Grynd Report, you get to learn about the creator of Atlanta’s “The Progress Report”.